One of the most important skills for a teacher is relationship building. When you commence a new school year, school term or start working with a new cohort of students you have the opportunity to get to know your students. This may include their knowledge, skills and experience in a subject area, or more personalised skills and attributes that will help you as their teacher to get to know them better and understand their learning and development needs. Strategies that I have implemented include starting class with games or activities that can help me identify their social, physical or intellectual development needs. For both mainstream students and students with special or diverse learning needs, I have utilised class lists / roles, timetables and relevant information for students with negotiated learning plans. I have engaged in conversations and received appropriately relevant information from teachers, year level and program co-ordinators who have had prior experience in working with the mainstream students and students with special or diverse learning needs. 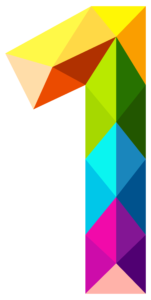 In situations where I have provided more 1:1 support with a student with special or diverse learning needs I have received their individual timetable to gain insight into the lessons and classes they will be attending, the class location and teacher. This enables me to consistently ‘check-in’ with the student to assess how they are feeling in the class and where they may need further support in the learning and teaching process. 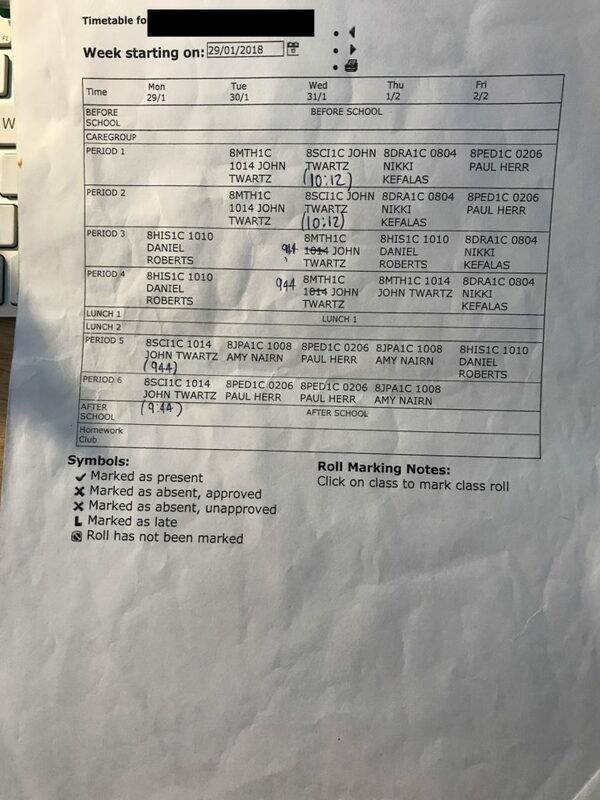 The artefact below is an example of a timetable for a student with special or diverse learning needs in a secondary setting. I am fortunate to have over 15 years of ‘teaching’ experience working with students of all ages, predominantly in primary and secondary school settings and within the local community. This has enabled me to facilitate and practice a variety of teaching methods, strategies and pedagogical approaches in the class environment. What I have gained from these experiences over time has enabled me to better understand how I can teach effectively and the most effective ways to motivate and engage students in the learning process. As a dance teacher, I understand the importance of students being actively engaged in their own learning. The pedagogies, methodologies and my overall philosophy for teaching is student-centred; highly collaborative; a constructivist and socio-cultural approach; developing the whole person and joyfully and positively impacting the health and wellbeing of every student. The most effective pedagogies I have utilised in my teaching practice have not only prevented disengagement but dramatically increased student’s confidence, motivation, ability to remain on task, group dynamics and ability to respond to challenges. Through reflection and evaluation from implementing teaching strategies and the refinement of my own teaching skills I have a solid foundation and understanding of how students learn effectively. It is this understanding that I will continue to reflect upon and refine in the future to ensure I have the capacity to teach students across a wider school setting. 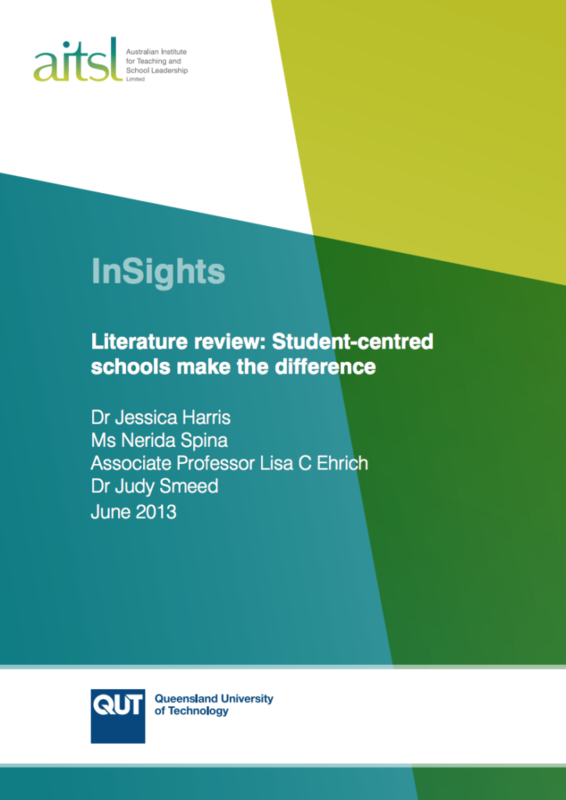 This artefact is a literature review conducted by The Australian Institute for Teaching and School Leadership (AITSL) and Queensland University of Technology. It supports my passion for student-centred teaching and learning and demonstrates research conducted to further understand how students learn. I have always maintained an inclusive approach to teaching and learning in my professional career. Over time I have had the privilege of working with students from culturally and linguistically diverse backgrounds, religious and socio-economic backgrounds. The artefact that I have chosen is a photo of me after I delivered a dance workshop at the Panpapanpalya joint dance congress in Adelaide in July 2018. This event was one of the world’s largest gatherings of dancers, dance educators, and artists of all ages. The theme of this conference was generating new thoughts and ideas for dance learning and teaching in the 21st century. The participants in my session came from diverse backgrounds and countries all over the world. 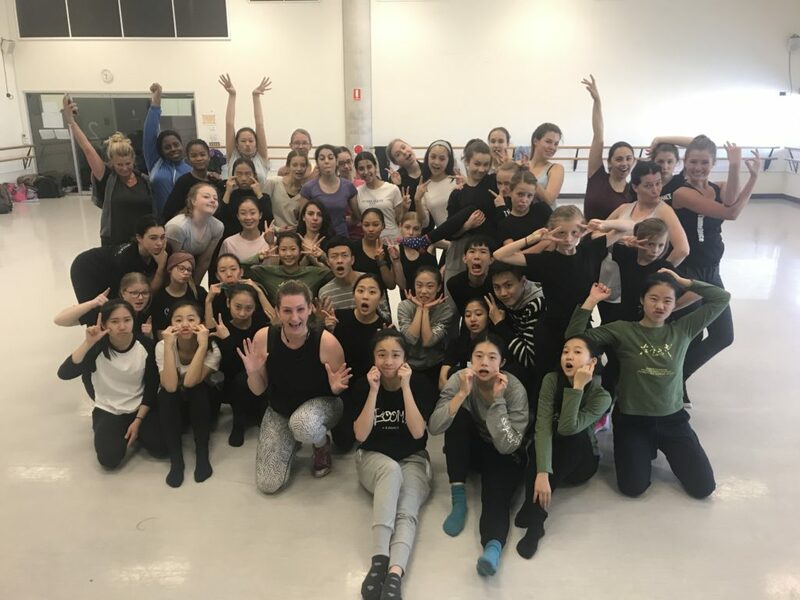 I utilised an inclusive student-centred approach to teaching dance that embraced diversity and valued both individual differences and the social-cultural differences amongst the class. The teaching strategies I incorporated involved detailed and explicit instruction and collaboration, ensuring that students were valued and recognised for the skills and attributes they brought to the class. A focus on self-expression and individuality ensured students felt supported and encouraged students to further explore and contribute their ideas. I upheld high expectations that all students would be successful in my class. The strategies I employ in a dance context are transferrable within the classroom environment. In particular, supporting EALD (English as an additional language) students in English classes. It is not uncommon within the teaching profession that teachers feel unskilled in how to relate to Aboriginal and Torres Strait Islander students, parent and caregivers. There is a clear need to embrace Indigenous identity in schooling and education. Teachers have a responsibility to ensure Indigenous students feel safe, valued and respected at school. I believe it is important as teachers that we show leadership and embrace ‘multicultural education.’ Educating about the differences between languages in the classroom is a positive approach to learning and building relationships that demonstrate mutual respect for Aboriginal and Torres Strait Islander culture and identity. I have completed studies in Aboriginal Education, culture and society and teaching Aboriginal and Torres Strait Islander students within the Arts. I discovered the ‘8 ways’ pedagogy and framework for teaching Aboriginal and Non-Aboriginal perspectives in the classroom. 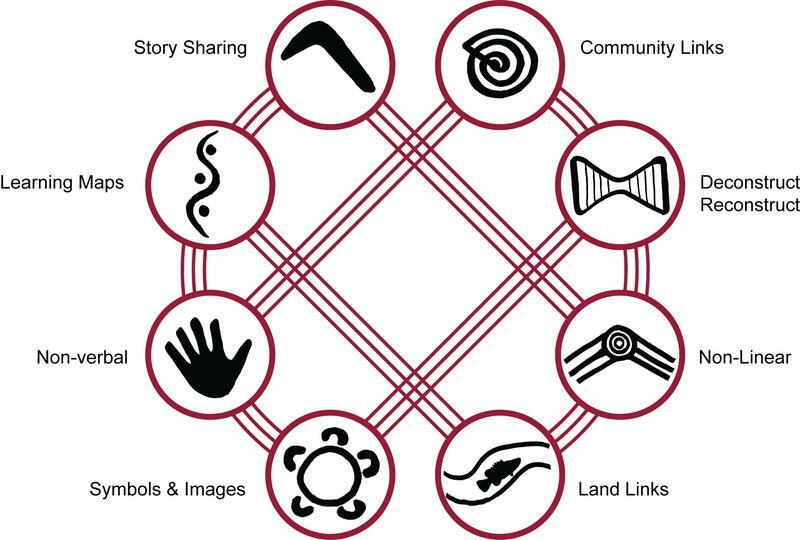 In particular I have embedded story telling, land and community links within my dance and drama practice and teaching resources. I utilise visual pathways ( mind mapping or brainstorming) as part of this unit encouraging small group collaboration and modelling. I incorporate Aboriginal processes of learning and knowledge transmission in the classroom to further develop my own teaching practice and understanding. The artefact I have chosen is diagram of the 8 ways pedagogy framework. Every student has their own learning style which should be considered in the planning and design of lessons. There are many ways to practice differentiation in the classroom. During my time as a school support officer I observed students being allocated the same activities to complete by the classroom teacher. Each task varied in terms of the difficulty for each student or group of students. Students with special and diverse learning needs were provided with a PowerPoint version of the class topic and asked to highlight the important and relevant information. This catered to the students learning styles and enabled them to participate fully in the class activity. The remaining students in the class were asked to take written notes of the PowerPoint noting the information relevant to the class topic. This was a year 8 history class. Other than observing differentiation in the classroom there are a few differentiation strategies I would like to practice in my final placement. This may include grouping students together based on their learning styles,interests, abilities and supporting and encouraging discussion based activities. I will include formative assessments to gauge students learning and adjust my lessons and planning to meet students needs. During my time as a school support officer I worked with students with special and diverse learning needs. For mainstream students with a Negotiated Education plan (NEP) we were given information on their year level and additional information pertaining to their specific needs (learning/sensory/physical). Modifications were made to their learning both in class and for assessment purposes. This information was made explicitly clear to teaching and support staff and communication between the school, parents and caregivers was made clear. 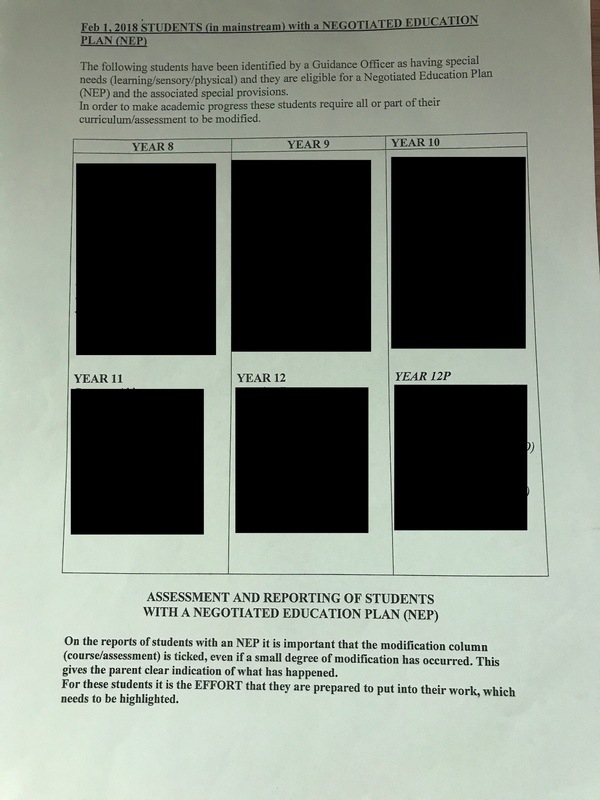 For assessment and reporting students with an NEP there was particular emphasis given to the effort and preparation each student put into their work. 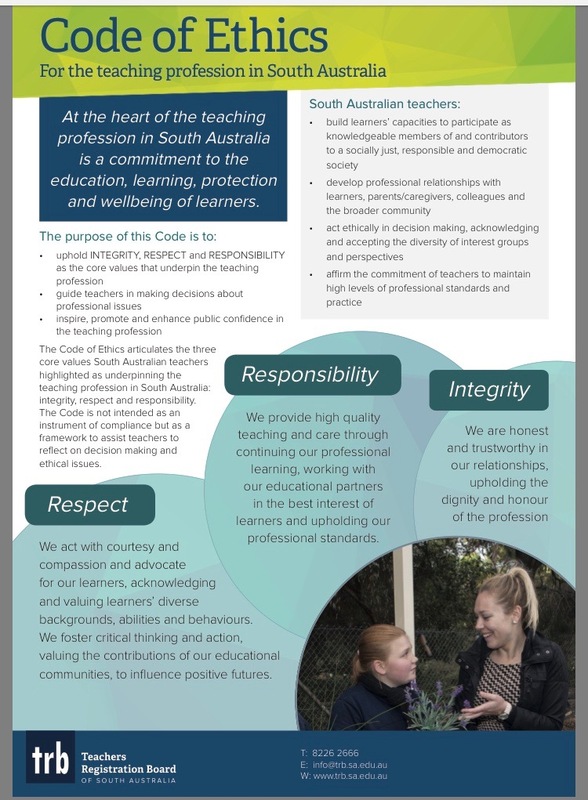 The Code of Ethics for the Teaching Profession in South Australiais a framework to assist teachers to reflect on decision making and ethical issues. 3 core values underpin the teaching profession: integrity, respect and responsibility. It is not intended as in instrument of compliance but as a framework to assist teachers to reflect on decision making and ethical issues. The value of respect involves acknowledging and valuing learners diverse backgrounds, abilities and behaviours. It is the teachers duty to build learners capacities to participate in society as knowledgeable and socially responsible individuals. The Melbourne Declaration on Educational Goals for Young Australians aims to improve educational outcomes for young Australians, including those with disabilities. Disability Discrimination Act 1992 is federal legislation that to ensure, as far as practicable, that persons with disabilities have the same rights to equality before the law as the rest of the community; and to promote recognition and acceptance within the community of the principle that persons with disabilities have the same fundamental rights as the rest of the community. The artefact below is information provided to me as a school support officer to identify students that I will be working with who have a Negotiated Education Plan (NEP). This is a tool that I have used to ensure I am providing the support necessary to further enable these students to achieve academically.